Expedition 57 crew members Alexey Ovchinin of Roscosmos (left) and Nick Hague of NASA (right) pose for pictures in front of their Soyuz MS-10 spacecraft. At the Baikonur Cosmodrome in Kazakhstan, NASA astronaut Nick Hague and Alexey Ovchinin of Roscosmos are preparing for their launch to the International Space Station. Their journey to the station will begin with a lift off at 4:40 a.m. EDT Thursday (2:40 p.m. in Baikonur). Live launch coverage will begin at 3:30 a.m. EDT on NASA Television and the agency’s website. At the time of launch, the space station will be flying over NE Kazakhstan at 254 statute miles. 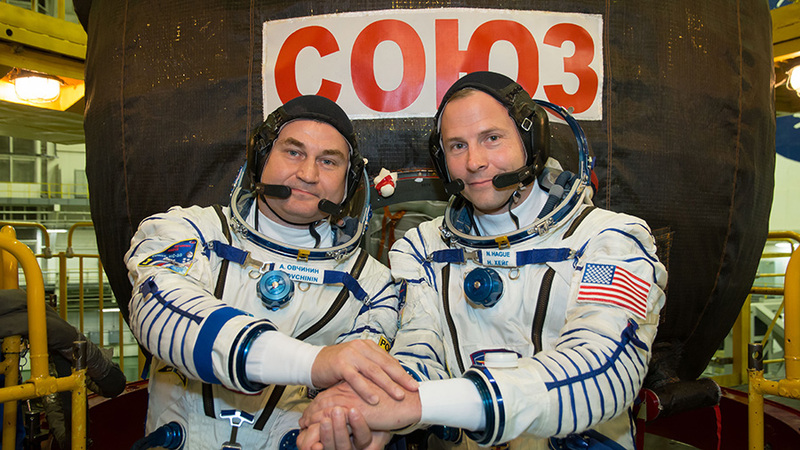 The two will join Expedition 57 Commander Alexander Gerst of ESA (European Space Agency, NASA Flight Engineer Serena Auñón-Chancellor and Roscosmos Flight Engineer Sergey Prokopyev, who arrived at the station in June.